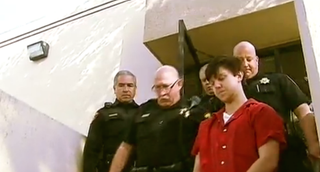 Ethan Couch is escorted by law-enforcement officials. "Affluenza" teen Ethan Couch, who recently turned 19, has been ordered by a Texas judge to serve nearly two years—720 days—in a county jail, the Associated Press reports. Couch appeared in adult court Wednesday in Tarrant County and was ordered to serve four consecutive 180-day terms, one term for each of the four people killed in his 2013 drunk driving crash. Criminal court Judge Wayne Salvant did acknowledge that the sentence was tentative, noting that "nothing I do is set in stone," and adding that he might reconsider. Salvant gave Couch's attorneys two weeks to prepare arguments regarding the sentences. Salvant also attached several conditions to Couch's probation for when he does leave jail, including prohibitions against drinking, using drugs or driving. Couch will also be required to meet regularly with a community supervision officer. Any future probation violation could be met with 40 years of prison time, 10 years for each person killed. Couch's defense argued in court Wednesday that Couch's original juvenile court conviction meant that he should have expected between 120 and 180 days in jail.